Are You One Of Those 'End-Of-The-World' Guys? In actual fact, I agree entirely with his latter two comments. I can’t be bothered reading the thoughts of a writer who says we’re all doomed, either. I, too, have a more positive outlook than that. My one discrepancy with such comments is that I don’t by any means think that the present state of events will lead to the end of the world, as he assumes. But then, neither am I naïve enough to think that if I just hope for the best, the powers that be will cease to be parasitical and predatory out of sympathy for me. They will not. For any serious student of history, one of the great realisations that occurs at some point is that governments are inherently controlling by nature. The more control they have, the more they desire and the more they pursue. After all, governments actually produce nothing. They exist solely upon what they can extract from the people they rule over. Therefore, their personal success is not measured by how well they serve their people, it’s measured by how much they can extractfrom the people. And so, it’s a given that all governments will pursue ever-greater levels of power over their minions up to and including the point of total dominance. It should be said that, on rare occasions, a people will rise up and create a governmental system in which the rights of the individual are paramount. This was true in the creation of the Athenian Republic and the American Constitution, and even the British Magna Carta. However, these events are quite rare in history and, worse, as soon as they take place, those who gain power do their best to diminish the newly-gained freedoms. Such freedoms can almost never be destroyed quickly, but, over time and “by slow operations,” as Thomas Jefferson was fond of saying, governments can be counted on to eventually destroy all freedoms. We’re passing through a period in history in which the process of removing freedoms is nearing completion in many of the world’s foremost jurisdictions. The EU and US, in particular, are leading the way in this effort. Consequently, it shouldn’t be surprising that some predict “the end of the world.” But, they couldn’t be more incorrect. Surely, in 1789, the more productive people of France may have felt that the developing French Revolution would culminate in Armageddon. Similarly, in 1917, those who created prosperity in Russia may well have wanted to throw up their hands as the Bolsheviks seized power from the Romanovs. There are many people, worldwide, but particularly in the centres of the present deterioration – the EU and US – who feel that, since the situation in their home country is nearing collapse, the entire world must also be falling apart. This is not only a very myopic viewpoint, it’s also quite inaccurate. At any point in civilization in the past 2000 years or more, there have alwaysbeen empires that were collapsing due to intolerable governmental dominance and there have alwaysconcurrently been alternative jurisdictions where the level of freedom was greater. In ancient Rome, when Diocletian devalued the currency, raised taxes, increased warfare and set price controls, those people who actually created the economy on a daily basis found themselves in the same boat as Europeans and Americans are finding themselves in, in the 21st century. It may have seemed like the end of the world, but it was not. Enough producers left Rome and started over again in other locations. Those other locations eventually thrived as a result of the influx of productive people, while Rome atrophied. It’s tempting to imagine that maybe the government will realise that they’re the only ones benefitting from the destruction of freedom and prosperity and they’ll feel bad and reverse the process. But this clearly will not happen. It’s also tempting to imagine that maybe it won’t get a whole lot worse and that life, although not all that good at present, might remain tolerable. Again, this is wishful thinking and the odds of it playing out in a positive way are slim indeed. This, of course, is the hard one. Begin by recognising the truth. If that truth is not palatable, study the situation carefully and, when a reasonably clear understanding has been reached, create an alternative. To be sure, those who investigate and analyze the present socio-economic-political deterioration do indeed espouse a great deal of gloom, but this should not be confused with doom. In actual fact, the whole point of shining a light into the gloom is to avoid having it end in doom. It should be said here that remaining in a country that is tumbling downhill socially, economically and politically is also not the end of the world. It is, however, true that the end result will not exactly be a happy one. If history repeats once again, it’s likely to be quite a miserable one. Those who undertake the study of the present deterioration must, admittedly, address some pretty depressing eventualities and it would be far easier to just curl up on the sofa with a six-pack and watch the game, but the fact remains: unless the coming problems are investigated and an alternative found, those who sit on the sofa will become the victims of their own lethargy. Sadly, we live in a period in history in which some of the nations that once held the greatest promise for the world are well on their way to becoming the most tyrannical. 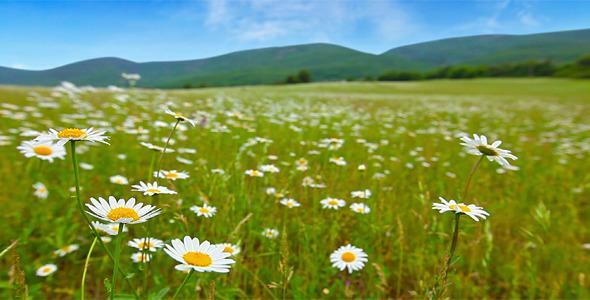 If by recognizing that fact, we can pursue better alternatives elsewhere on the globe, as people have done in previous eras; we may actually find that the field of daisies in the image above is still very much in existence, it’s just a bit further afield than it was in years gone by. And it is absolutely worthy of pursuit.